In 2011 I launched my first business, in launching that business I became something I never thought I'd be, self employed. It was amazing until I realized I really was employed by me, and my boss was awful. And when she is YOU, it's awkward, like really awkward. I was working 80 hours a week in a job I'd created. It wasn't something I was passionate about or invested in. It was just a job that had the benefit of allowing me to work from home. Almost exactly one year later I did something I'd wanted to do my entire life, and it changed my business in a very unexpected way. I dyed my hair pink. It is something I dreamed about doing since I was a little girl and obsessed with Jem of Jem and the Holograms, which in retrospect clearly had a big impact on my adult life. It was also something I didn't think I'd ever be allowed to do. I mean in the last few years fantasy colors have been made a bit more mainstream but most office jobs still frown on anything that's not natural. One day though it hit me, I didn't have most office jobs, I worked for myself and could do ANYTHING I wanted. So I went on a mission for pink hair. I remember right after doing it I freaked out a bit. I mean this was a HUGE thing. I refused to post anything on social, horrified that a client might see it and freak out. My ability to hide ended about 2 months later when I was invited to attend an event for a client. I was so nervous before attending I seriously considered buying a wig to cover it up. In the end though I remembered that this was what I wanted, and that it was going to be fine. I headed to Los Angeles for the event, walked into the hotel conference room and guess what, everyone LOVED it. Most folks were so intrigued by it, they came up and asked about it and complimented it. More than a few wishing they were brave enough to pull of such a look. It was amazing! The best part was I connected with a few people who I'd connected with only via social media before the event and they said they had no idea how fun I'd be. That my social media pictures and updates just didn't do me justice. That's when the change started to hit the rest of my business. I came home and evaluated EVERYTHING which lead to me actually closing that first business and opening my current business that was much more aligned with my personality and what I wanted out of life. 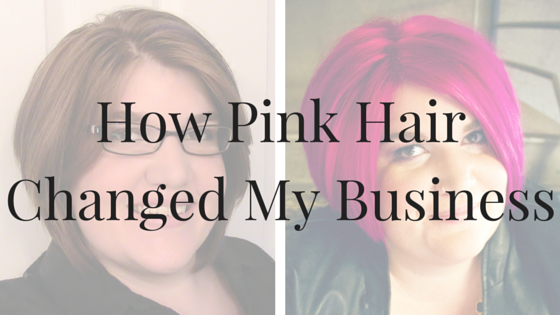 Now 3 years later as I hit the 4 year anniversary of entrepreneurship I realize that my pink hair serves more as a really handy way to get found at an event, or even a key way to stick in the memory of folks who attending my speaking engagements. It's my reminder that these things are my choice, not my peers, not my coach, not my clients even, it has to be right for me. The best part, I love my boss now, she's always looking out for me.